-Very mobile, fly as swarms by day. Hoppers move in band. Colour -Hoppers uniformly green in early instars but may be brown in last two instars. -Adult pale grayish brown, buffer peach coloured. Males change to pale yellow on sexual maturation. -Adults rosy pink on fledging, darkens with age to grayish or brownish red then to yellow on sexual maturation. Males are brighter. In all, there are three breeding seasons for locusts (i) Winter breeding [November to December], (ii) Spring breeding [January to June] and (iii) Summer breeding [July to October]. India has only one locust breeding season and that is Summer breeding. The neighboring country Pakistan has both spring and summer breeding. 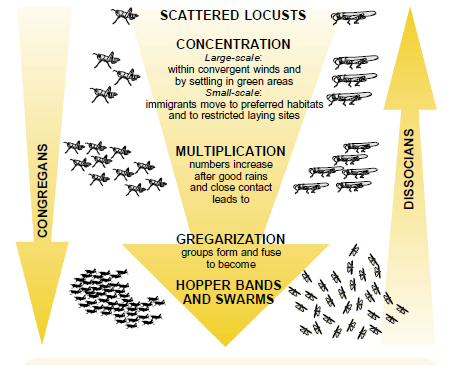 In India, the scheme Locust Control and Research (LC&R) is responsible for control of Desert Locust and is being implemented through Organisation known as “Locust Warning Organisation (LWO)” established in 1939 and later amalgamated with the Directorate of Plant Protection Quarantine and Storage in 1946. Locust Warning organization (LWO) is responsible to monitor and control the locust situation in Scheduled Desert Area (SDA) mainly in the States of Rajasthan and Gujarat while partly in the States of Punjab and Haryana by way of intensive survey , surveillance, monitoring and control operations where required.